But is it better than the iPhone 6? Verdict: A fantastic return to form for Samsung. It’s comprehensive, but don’t expect to be blown away by it. AFTER A TOUGH 2014, Samsung was forced to go back to the drawing board and figure out a way to both reverse falling profits and regain ground lost to its rivals. Its solution was the S6 and the S6 Edge, two devices which carry the hopes of the Korean giant on their shoulders. The S6 is spearheading this charge and while it’s received a positive reception, how does it fare? Note: the S6 we had was a preview sample meaning that there may be some differences between it and the final version. A big deal has been made of Samsung’s move from plastic to metal and in short, it’s rather classy, but while it’s a major step forward for the company, there are some caveats. For now, we’ll stick to the design which sports a metal rim combined with a glass front and back, the rear camera jutting out just a little. The sides are smoothed out to allow for better grip and it feels solid to hold. It sticks to a 5.1-inch screen which is the right size for a premium device, enough to appreciate what’s on screen yet have a firm grip when making calls. The fingerprint scanner makes a reappearance, but now you rest your finger or thumb on the home button, and it comes pretty close to matching the quality of the iPhone’s version. This was a wise decision as the S5′s version was seriously hit and miss, especially if you were using it one-handed as you had to swipe it. It also helps that the home button is a little bigger than the S5′s meaning there’s less room for error. It is a pity that Samsung didn’t go for an entirely metal backing like the S6 Edge as overall, the design is perhaps a step away from matching the iPhone (although you’d be forgiven for confusing the two if put together), but it’s still a very positive step forward, if not a revolutionary one. As you would expect, the S6 gets a bump up in specs compared to its predecessor. Two quad-core CPUs (1.5 GHz and 2.1GHz), 3GB of RAM, and Samsung’s own Exynos processor ensures that performance is kept high, even when you’re running multiple apps. The resolution has jumped up to 1440 x 2560 pixels with ~577 ppi (pixel per inch) pixel density. This packs a significant amount of quality when watching shows or playing games, although at this point, you may find it hard to notice the difference unless you’re upgrading from an older smartphone. We mentioned caveats earlier on in design and there are a few changes that may upset fans. Alongside the omission of water and dust resistance, the two biggest features missing are a micro SD slot and a removable battery. This will likely annoy some people, although the fact that storage starts at 32GB and goes up to 128GB may soften the blow a little. Speaking of the battery, its capacity has been reduced from 2,800 mAh to 2,550 mAh. There’s a good reason why Samsung has been able to claim ten minutes of charging can provide four hours of usage. Through normal use, it’s able to manage a full day, and for the most part, we were left with roughly 15-20% of battery left after a normal day so it’s good, but not amazing. There is the option of wireless charging, but you will have to buy the charging pad separately if you want to avail of it. If there’s a phrase that sums up the S6′s version of Android, it’s ‘less is more.’ TouchWiz, its version of Android, is infamous for the amount of bloatware it brings with it but this time, it’s Lollipop and Material Design that takes centre stage. Actually, it’s rather refreshing just how much Samsung resisted the urge to throw in numerous, mostly redundant, features that has plagued previous versions. Instead, the few features left from TouchWiz manages to elevate Lollipop instead of hindering it, allowing for a more seamless experience. Some features from other Samsung devices have also made it in. The most noticeable inclusion is reducing the screen size of an app so you can multitask. Carried over from the Note 4, it allows you to have apps like Twitter or Facebook in the corner while you browse your phone. It’s taken a step further as you can reduce it to an icon bubble, similar to how Facebook’s Chat Heads works on Android. It does miss a trick by not allowing you to close an app by dragging it down – instead you have to open it up again so you can remove it – but you would imagine Samsung will add that functionality in its next update. The hardware the S6 packs makes multitasking a possibility. Even when playing games like Monument Valley and Spirit Lords while a YouTube video is playing in the bottom right-hand corner, at no point did it ever feel like the S6 was having any difficulties. While the S6 has been all about improving and making a clear jump from the S5, the real improvements come with the 16MP and 5MP rear and front end cameras. While it hyped up the improvements in its keynote at MWC 15, it lives up to expectations. Double-tapping the home button boots up the camera, which may seem odd at first but really, it makes sense when you consider how much of a shift there is towards portrait mode photos and videos, and the likelihood of you using the phone one-handed. And it’s great as not only can the camera boot up almost immediately (0.6 seconds according to Samsung), but it also manages to get the focus right in that time as well which is seriously impressive. More importantly, it’s just fun to do. The quality of its auto function, which usually gets the focus right in its first go, allows you to be spontaneous when taking photos, and you only have yourself to blame if you aren’t able to capture a photo fast enough. The biggest improvement is the camera’s aperture which is now F1.9. Bascially, it means it’s much better at capturing low-light photos. To the S6′s credit, it’s able to figure out the right level of lighting for evening shots, although you wouldn’t initially think it when you’re taking the shot in the first place as the screen can look grainy when you’re setting it up. Yet when it’s captured, it’s pretty solid. While the Galaxy S range was always great, you could never shake off the feeling that that Samsung was throwing numerous ideas to the wall and seeing what stuck, possibility a mixture of trying to think one step ahead of its competitors and not really knowing what it was that users wanted. That’s not the case with the S6. Instead, it’s one of the more considered and thoughtful devices Samsung has created, one that’s willing to make the necessary sacrifices and changes to create a fantastic device. Inevitably, it’s going to be compared to the iPhone 6 and that can’t be helped. Is it better? Honestly, that depends on what your preferences are and how much you’ve invested in iOS or Android, but you’re not going to go wrong either way. - Fantastic display and hardware. - The camera is fast, sharp and versatile. - Incredibly fast performance with no slowdown. - TouchWiz manages to enhance Android Lollipop instead of hindering it. - New design isn’t as big a leap or as exciting as you would think. - Lack of a micro SD slot and removable battery may bother some fans. - Battery life isn’t as strong as it could be. 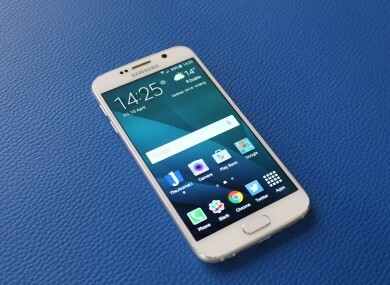 The Samsung Galaxy S6′s starting price for the 32GB version ranges from €49 – €699 (depending on bill pay/PAYG offers) and is available in Vodafone, Three, Meteor, Tesco Mobile, eMobile and Carphone Warehouse. Email “With the Galaxy S6, Samsung has created its best smartphone in ages”. Feedback on “With the Galaxy S6, Samsung has created its best smartphone in ages”.